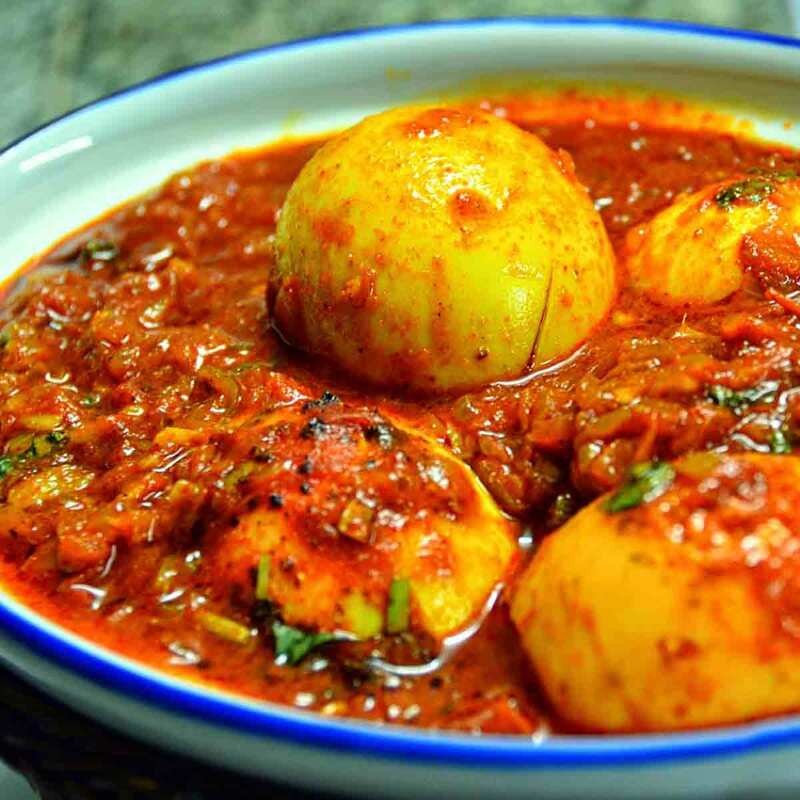 This is a flavourful egg gravy that pairs great as a side dish with ghee rice, pudina rice, jeera rice, kuska biryani, chapathi, veg pulao or any biryani varieties. The mint leaves (pudina) give an exotic flavour to the dish and kitchen king masala or garam masala is the star of this recipe, that enhances the aroma and taste leaving you fascinated. Pair it with roti and get the complete touch of an exquisite meal. Boil the eggs and remove the shell. Pierce the whites randomly, try using a fork, to help the eggs absorb flavors. This step is optional. While the eggs boil, powder the cashews first and then add some warm water to it. Leave it to soak for sometime and then make a fine paste. If using coconut, blend to a smooth paste. Set aside. Heat a deep pan with oil, add spices and allow them to splutter. Add onions, sprinkle salt and fry till onions turn slightly brown or can caramelize to enhance the aroma. Add ginger garlic paste and saute till it becomes fragrant. Add tomatoes, fry till they turn mushy. Add chili powder, turmeric and masala powder. Fry till it begins to smell of the masala. Pour the cashew paste or coconut paste, fry till the mix leaves the sides of the pan. Add eggs, mint leaves, coriander leaves. Fry for 2 mins till aromatic. Add water to partially cover the eggs and cook till the curry thickens.